To that end, the Milstein family served as the lead sponsor for the Médecins Sans Frontières / Doctors Without Borders symposium, “No Time to Wait.” The 2007 worldwide gathering – of scientists, physicians, philanthropists, drug company executives, government officials, international agencies, students and journalists – had one purpose: to make immediate and measurable gains against tuberculosis. The proceedings of the symposium were published by the Milstein family in 2009 and made available to a wide circle of researchers, libraries, policymakers, government agencies and other end users. 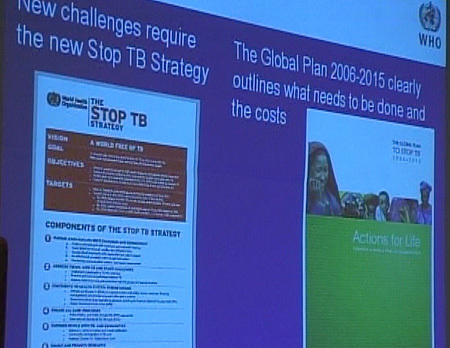 A PowerPoint presentation made at the 2007 “No Time to Wait” symposium in New York City.